This brings up a number of interesting questions. - Can Moxy be used as a way to verify ischemia while minimizing the cuff pressure? - Is external occlusion needed at all if Moxy is used to guide "Incomplete Recovery" or "No Recovery" workouts? Roger long overdue respond on your link here and the use of MOXY. Reason. I had to wait till this semester but next week we have the PE teachers in and student and we run a grade 12 project on most effective way of using MOY in strength workout and intervals when looking at the actual performance changes.. We will have 4 categories of data collection and we try to get as many students involved in the assessment so we may have 50 - 100 samples of assessment. In short the assignment is. What recovery strategy ends with the best performance in the 2 /3 and 4 rep.
a) incomplete recovery and we will fix the incomplete recovery by a 50 % of baseline recovery from each prior steep. b) complete recovery and we use the second load as the baseline level. c) Overload highest pint recovery and we will sue the second load overload SmO2 trend as the target to reach. d) overload back down to base line and again the second load will be the base line to aim for. 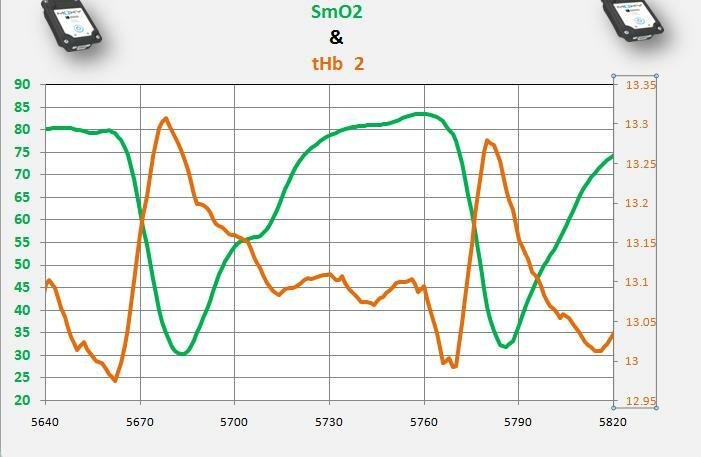 So the load will be controlled by SmO2 but we will look at reaction of tHb as it may explain failure in the workout. Goal : Integrate MOXY in the school sport, as Brian already has done in Ontario schools so kids combine physiology , high tech fun on a screen and motivation together with individual training loads. So not 5 sets 15 reps 1 min break in between just simple physiological feedback fro the target we have. 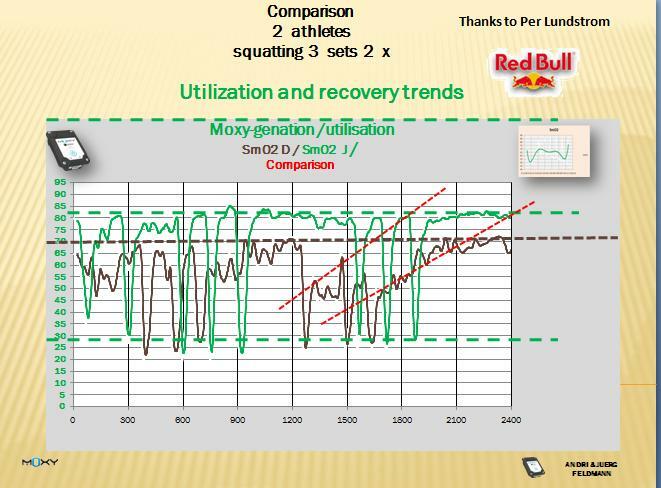 We can plan workout's based on metabolic targets ( SmO2 trends or on delivery limitations tHb trends. Will see where the kids like to publish this fun semester work . Thanks to Earl ( my goat partner) ( carrier prep teacher ) and Mr.Kitamura, the PE teacher for the opportunity they give to this kids. Short update. on our student fun project. Yesterday we started the pre- phase of getting all set up and look for the PE class, which will be used. There are some additional sections we look for. 1. In strength training , if I like to create high contraction speed I am better on using low weights than heavy weight ??? !!! 2. The trend in SmO2 will be more or less the trend in restoring CrP. So a very " anaerobic ", or better O2 independent, energy source is really very O2 dependent. as it needs O2 for restoration. 3. If that may be true we should clearly see the best performance in a recovery which would be the reach of the highest point after a load in SmO2 " overreach"
So will be fun to look at this. 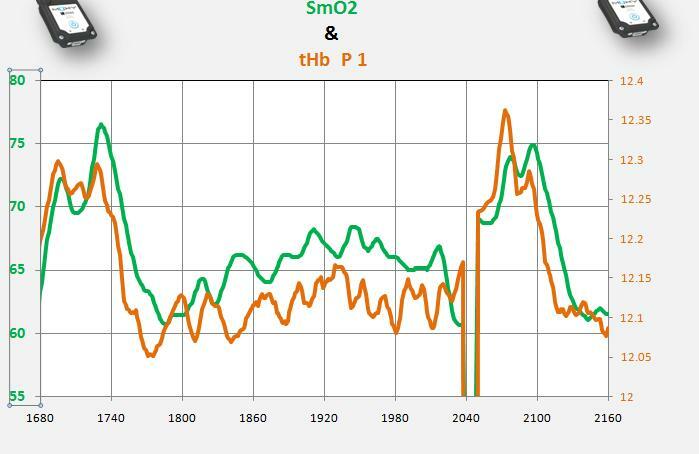 IF and only IF SmO2 under stable pH situation" so pH not too low so not below 7 ) down is basically a mirror of CrP recovery so we really can use MOXY for an optimal planning of load and recovery ideas. This means, that we can manipulate pH to a certain extend over ???? as well we have to avoid in some cases a too long arterial occlusion. ( which would get against the idea of occlusion training with compression systems. What this idea, ( which shows up every 15 +- years has to add is most likely a better control over SmO2 so we can avoid some of the negative side effect occlusion workouts can create. Here's a regular client session I coached earlier this week using the MOXY info. 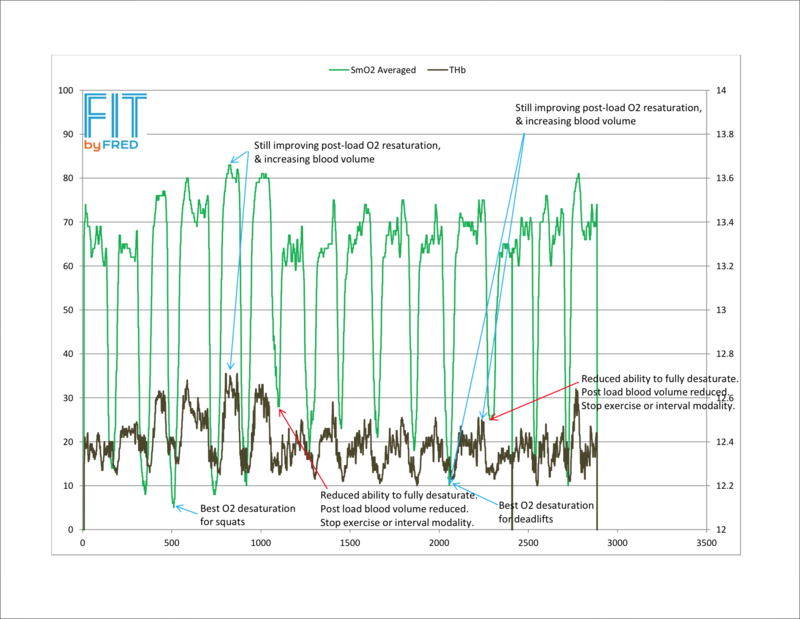 To guide the reps, sets and exercise selection, I monitor the BFR effect (currently without cuff) the loading has on the tHb at start of load AND the reaction at end of load PLUS the post-load periods. There's plenty of practical info on the image below, and I'm keen to discuss with anyone interested. Okay I am somewhat behind. Hmmm lag time like lactate testing ( smile) Here an add on to Fred's great contribution on here. Like to try to make a summary. 1. There is still a strange perception out there , even in highly exercise practical groups, that there is a difference between strength workouts like 1 max rep or a few heavy lifts and an endurance load like a 60 min TT and so on. This is based on the classical notion of anaerobe and aerob and the alacticid and lacticid ideas. Thanks to great research this part is over now and we can focus more on how we can try to improve delivery and or utilization, depending where the weakest link is. Some how we got stuck , that this are different worlds. Reality is , that both activities simply need to have energy and the end product they have to keep balanced is ATP. The ultimate energy to be able to do this is coming from O2.
. So it is less the problem on what is used but much rather how it can be delivered. In strength there is most often a delivery problem as the delivery is not activated enough and or it is not sufficient enough for the demand and or the delivery is reduced or interrupted due to muscle contraction. So when planning a strength workout we , as in any other workout , set a target on what I may like to achieve. This is crucial , as in case of a) I have to try to reduce or if possible even try to avoid an arterial occlusion intensity. In b I may exactly target this. Than the question is , whether I I like to integrate respiration to prolong or to shorten the workout with the same load. Below an example we showed some times ago . A workout ) ( 1 leg squatting ) with and without respiratory manipulation.. You can see how the duration of the same load can change. 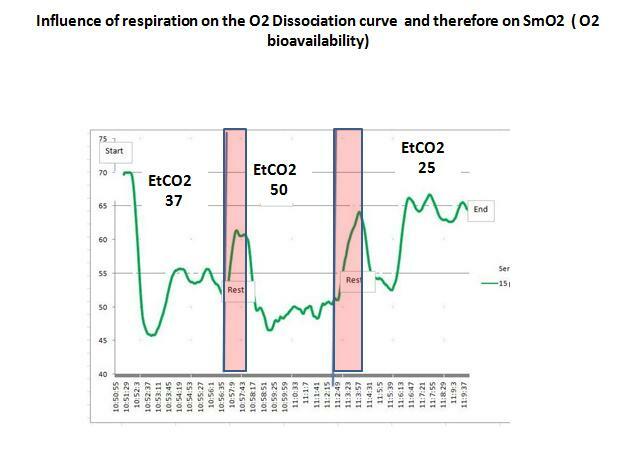 Now respiration has a direct influence on the O2 bio availability. Unfortunately what looks great on SmO2 increase may be actually not great for the performance. And increase in SmO2 is not always a good sign at all. 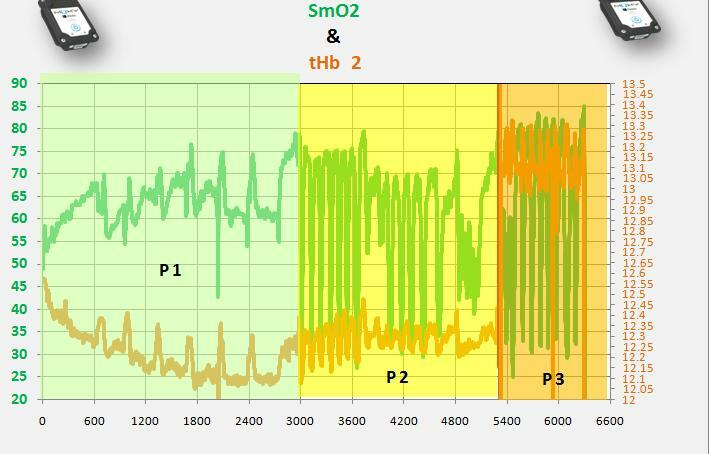 Here a case study first on just SmO2 trend and EtCO2 levels. Now is this a nice theory or can we show this with blood values support. 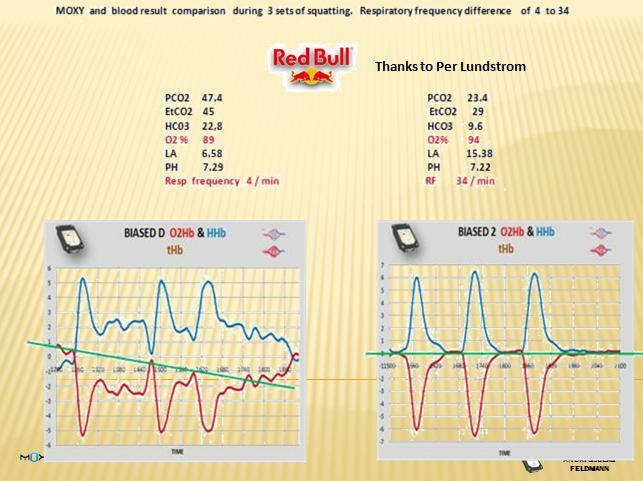 Here a case study courtesy to the red Bull seminar and one of our case study discussion for MOXY experts. Exercise squatting of two people to failure. Here a small jump to the reaction we played with O2 diss curve. Look at the lactate values and the EtCO2. For a very simple explanation for coaches. You can increase lactate to incredible high values as long you can balance H + situation. It is not the lactate , which creates some failure but a combination of H + and most likely some additional metabolites or substances Pi and so on. ( still discussion going on ). What we know from very practical examples is, that when we can stay normocapnic and or even have a chance to go for a while towards hypocapnic, we can nicely create stimuli for MCT 1 and MCT 4 ideas. As well, we can create a very different load situation. For cyclists a simple try out. Get your client to ride on MaxLass or what ever you believe in , simply try to create a stable lactate level. for 5 - 8 min. Than stay on this level and simple breathe deeper and slower so you shift the O2 disscurve to the right and test lactate after 3 - 4 min. What is the result ? Than do the opposite . 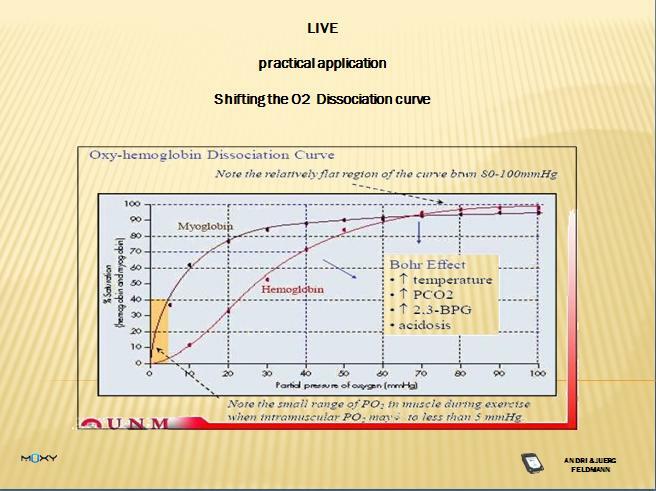 Go Max Lass intensity and breath hypocapnic check what the lactate is doing now.? Than add MOXY and you can see why we simply can't use a SmO2 trend and argue when it does down lactate goes up and when it goes up lactate goes down. Would be nice ,but it is not always the case. Now in Fred's case here a short start and i WILL BE BACK. Here an overview of the total data collection done by Fred. Now without explanation as the regular reader is becoming an expert already a closer look at the P1 stimulation and the P3 stimulation. can you see the difference the load created and what do you stimulate in P1 or what is different in the stimulation? P1 here with a closer look. And here P2 closer look. Have fun and see the potential in quality control on your client. It is very different and a great progress, we just need some time to get our head around changes.